The Target Saver: Target: SkinnyPop Popcorn - Moneymaker! 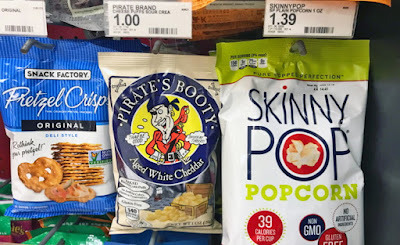 Target: SkinnyPop Popcorn - Moneymaker! Here's this new moneymaker on SkinnyPop Popcorn at Target! This SkinnyPop popcorn is so good! As we know each one-ounce bag sells for $1.39.. Use a $1.00 manufacturer coupon on your Target app. After your purchase, submit your receipt for a new $0.75 Ibotta rebate offer. The Ibotta rebate offer has a limit of one. But sometimes see rebate offers reset, and you will be able to redeem another rebate offer at that time.